Congratulations to Dr. Justin Teeguarden, senior scientist at Pacific Northwest National Laboratory who, along with former PNNL scientist Dr. Harish Shankaran, received the Best Abstract Award for 2014 from the Risk Assessment Specialty Section (RASS) of the Society of Toxicology (SOT). Teeguarden will present the poster "Improving Urine-Based Human Exposure Assessment of Short-Lived Chemicals Using Reverse Dosimetry and NHANES Physiological and Behavior Data: A Value-of-Information Approach for Bisphenol A" at the SOT Annual Meeting March 24-27 in Phoenix, Arizona. He and Shankaran will also be recognized at a reception March 26 and receive a plaque from the society. The RASS has 665 members, and is one of 27 specialty sections of the SOT, a scientific society that promotes the acquisition and use of toxicology knowledge and aids in the protection of public health. 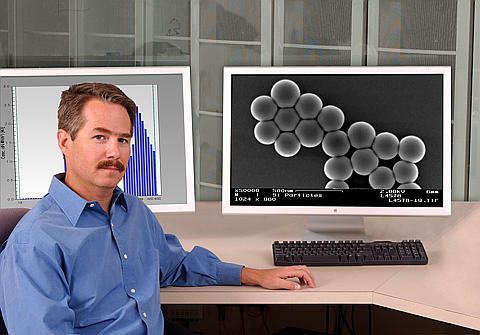 Teeguarden, who has a background in pharmacokinetics, leads research related to chemical risk assessment and health effects, most notably that related to the use of Bisphenol A (BPA) in plastics, and has served on national advisory panels for the National Research Council and the National Academy of Sciences.